I love this two-parter a lot. I have such a hard time picking favorites, but during this re-watch, as I got to Messages from Earth - Point of No Return - Severed Dreams, I was thinking "this must be it right here, the high point of the season" (or of the whole show, perhaps?). But then of course there's War Without End. And I'm right back to "no, never mind, I'm not even going to try to pick". It's so great because it builds on a storyline that was introduced two seasons ago, not just quickly thrown in in the previous episode. It makes everything fit together nicely. It's really very satisfying to have the Babylon Squared mysteries resolved, and see how everything fits with the Shadow War, the Minbari prophecies, and everything else. It would still work if you hadn't seen Babylon Squared, too. It's kind of easy to forget that sort of thing, from a 2015 point of view with a full DVD collection on hand, but that must have been a pretty big concern for producers and such. I think they pulled it off really well. So ... is there a raccoon infestation on Epsilon 3 or what? That sure is an interesting costume Zathras is wearing. I do love the Zathras character(s). He is funny, but not just comic relief. He's basically orchestrating this whole time jump thing (based on Draal's instructions, but still). Those messages B5 starts picking up from themselves .. pretty chilling. I'm sort of surprised everyone seems so cool about this. I suppose they're trained military, they are constantly in dangerous and/or creepy situations, and they have been dealing with this Shadow war threat for a while now, but still. If I heard/saw a recording of myself amidst the destruction of my space station, I imagine I'd be a bit unsettled Anyway, I like that story element a lot. Creepy messages from a future that will come to pass if you fail at a specific undertaking. It also means, I suppose, that in an alternate universe, that is exactly what did happen to you. Sheridan in the future: A very interesting preview of the Centauri Prime/Keeper storyline. "The war is never entirely over". 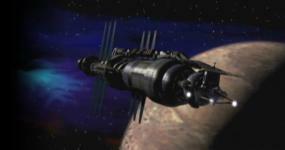 It wouldn't be Babylon 5 if the Shadow War was won and everyone lived happily ever after, now would it? As for the "first kiss" thing, you know, I'm not sure I even realized that the Delenn/Sheridan first kiss isn't technically really a "first" kiss as such, until I saw/heard other people talking about it (I'm very perceptive ). How cleverly done! I really like that the Delenn/Sheridan relationship evolves slowly. Aside from the fact that that makes sense for them to not have too much time to relax and/or be alone, because they both have SO MUCH important stuff to deal with, it's just more realistic in general. It annoys me to no end that many tv/movie relationships seem to be based on nothing at all. People go from "hi, I'm so-and-so" to "I love you" in about five seconds. You don't know anything about that person! Sheridan and Delenn, on the other hand, had plenty of time to get to know each other. "A Minbari not born of Minbari": I love the Sinclair = Valen reveal. It's fun to watch with people who are new to the show and see the realization dawn on their faces, much like Marcus' at the end of WWE pt II. After 20-ish years, it's still exciting to see Sinclair turned into a full Minbari, with his shiny Vorlons. But, more than that, it's just so cool how it fits with the whole Minbari background. Minbari spirituality isn't just a bunch of details invented to give the culture a bit of color. "In Valen's name" isn't just something to say to make them look more distinct from humans or other races. It all ties together with the main storyline of the show. This is excellent stuff. Thank you, I certainly will! Apparently I have a lot to say! I guess I have almost 20 years of comments saved up and now that I'm letting them out, I don't think I can stop! Once I'm done with all of the Babylon 5 episodes, I'll be watching Crusade for the first time ever! I only just bought it. That should be interesting ... I don't yet have any comment saved up for that. Well, your obsession has brought some life back to this forum I must say. It could help inspire me to buy the series, finally. Now THAT would be a useful thing indeed! You might be able to get it fairly cheap now ... I just bought the Crusade DVD set for something like $12.